South Boston, VA – Track official earlier this week released a full 2015 schedule for the NASCAR Home Track with a pleasant mix of local racing and outside touring divisions. The 2015 schedule will see the NASCAR Whelen All-American Series Late Model Stock Cars 15 separate times with a great mix of long distance races and twin features. On the schedule again this seasons is the PASS Super Late Model series. Again returning twice this season in June & August. Returning again this season will be the ground pounding Southern Modified’s for their 150 lap features. 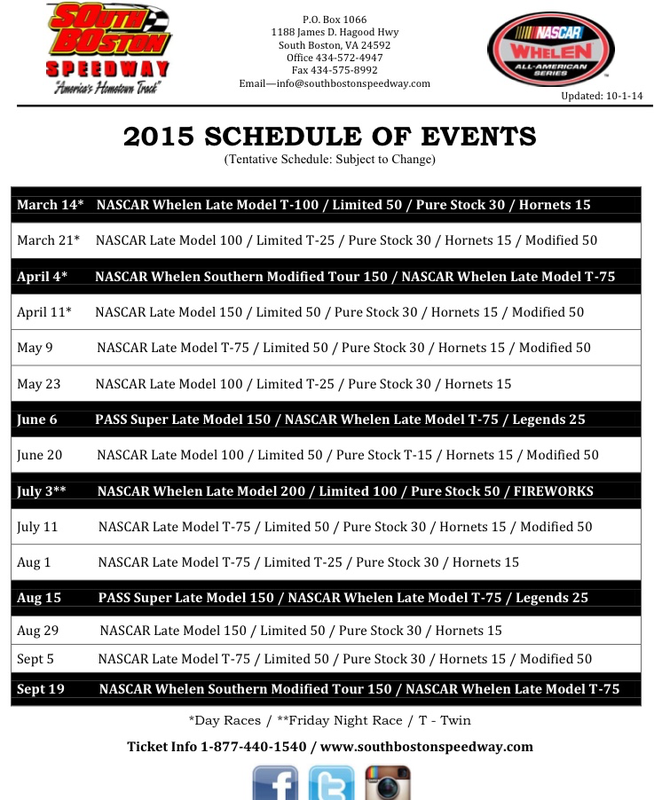 There races are schedule for early April, and September to close out the South Boston season. Coming back to the schedule is the heavily favorited pre 4th of July celebration that will include a 200 lap feature for the Late Model Stock Car division – I will have to check more into this for you guys but this race should serve again as the first leg of another VA Triple Crown series. Back again this year will be a 100 lap Sportsman feature as well as a 50 lap Pure Stock event followed by fireworks to close out the evening. All of this and much more is set get kicked off early this season on March 14, 2015 as the seasons first day race. Twin 100 lap LMSC races are the staple race of the day, including a 50 lap limited race, 30 for the Pure Stocks, and 15 for the Hornet division.